September 1, 2016, West Hartford, CT – West Hartford students and staff defied the downpours of rain yesterday to gather donations for the homeless to support the campus’ “Backpack Give Back” drive at a Back to School Carnival and barbecue. The very bravest among them even volunteered to get ‘dunked’ for cash donations that went to purchase supplies. Special thanks to Campus President Kim Colbert, Admissions Representatives Michael Cairo and Manny Rivera, and student Octavia Camby for your example and passion to support those in need! Through the help of our #AIfamily and friends, American Institute was able to provide 100 backpacks to those in need with essential items inside them like socks, toiletries, and basic first aid. 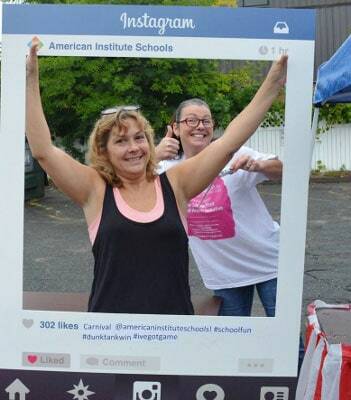 Stephen Schwartz, Chief Financial Officer, noted, “American Institute is passionate about providing tangible and engaging opportunities for students and staff to serve our local community, and I’m proud of the team in West Hartford for making a positive impact despite the rainy weather.” Thanks also to Hot93.7 for supporting the event and encouraging donations!